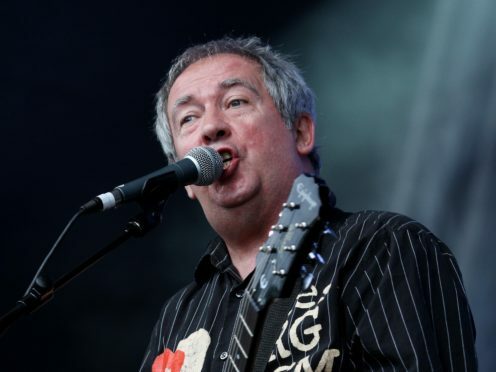 The music world has been paying tribute to “huge talent” Pete Shelley, the Buzzcocks frontman who has died aged 63. Shelley co-founded the band and penned the 1978 punk classic Ever Fallen In Love (With Someone You Shouldn’t’ve). “It’s with great sadness that we confirm the death of Pete Shelley, one of the UK’s most influential and prolific songwriters and co-founder of the seminal original punk band Buzzcocks,” the band wrote on Facebook. Shelley is reported to have suffered a heart attack at his home in Estonia. Red Hot Chili Peppers bassist Flea tweeted that the band’s Why Can’t I Touch It is “one of my favourite rock songs ever. Absolutely stunning. God bless Pete Shelley”. Pearl Jam’s Jeff Ament said that he was “Hollow Inside”. “Playing shows with the Buzzcocks was one of the highlights of my life,” he said on Twitter. The Pixies also paid tribute while Jonathan Ross said a Buzzcocks’ gig was “one of the best nights of my life”. I’ve seen a lot of great bands live. But the Buzzcocks at the Marquee in 1977 was one of the best nights of my life. RIP Pete Shelley. You were amazing. Tim Burgess, lead singer of The Charlatans, said Shelley would be remembered “for a long, long time” for his “brilliant” work. Tracey Thorn, formerly one half of dance music duo Everything But The Girl, also paid her respects, quoting from Buzzcocks track 16 Again. Author Neil Gaiman said that part of his youth had died along with Shelley. Hot Fuzz director Edgar Wright said Shelley was a “huge talent”. Shelley was born in Leigh and formed Buzzcocks in Bolton in 1975 with Howard Devoto.